Spices are defined as "a strongly flavored or aromatic substance of vegetable origin, obtained from tropical plants, commonly used as a condiment". In ancient times, spices were as precious as gold; and as significant as medicines , preservatives and perfumes. 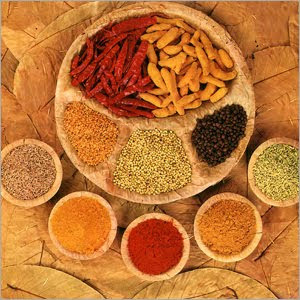 India - the land of spices, plays a significant role in the global spices market. No country in the world produces as many kinds of spices as India with quality spices come from Kerala, an Indian state. At present, India produces around 2.5 million tones of different spices valued at approximately 3 billion US $, and holds the premier position in the world. Because of the varying climates - from tropical to sub-tropical to temperate-almost all spices are grown in this country. In almost all of the 25 states and seven union territories of India, at least one spice is grown in abundance. Spices and herbs are good not only for our taste buds but also for our health. They supply calcium, iron, vitamin B, vitamin C , carotene and other antioxidants. For instance fresh parsley has been linked with cancer prevention due to its antioxidant content and spicy food is much more appealing than a vitamin pill. Besides herbs and spices don't have any kilojoules or fact, so you can eat them to your heart's content. The fame of Indian spices is older than the recorded history. The story of Indian Spices is more than 7000 years old. Centuries before Greece and Rome had been discovered, sailing ships were carrying Indian spices, perfumes and textiles to Mesopotamia, Arabia and Egypt. It was the lure of these that brought many seafarers to the shores of India. In the ancient era, the Greek merchants thronged the markets of South India, buying several expensive items including the spices. Epicurean Rome was spending a fortune on Indian spices, silks, brocades, Dhaka Muslin and cloth of gold, etc. It is believed that the Parthian wars were being fought by Rome largely to keep open the trade route to India. It is also said that Indian spices and her famed products were the main lure for crusades and expeditions to the East. With the arrival of the Muslims the scenario altered further. An assortment of spices was used in Muslim preparations and the usage of such spices was popularised throughout the nation under the Muslim rule. As a result such spices gradually became a part of the Indian cuisines. Indian spice trading underwent changes once again during the colonial rule. As far as trading is concerned the Arabian traders were quite instrumental in popularising the Indian spices in the different corners of the world. In India, Arabian traders got the rare and exotic spices of the Far East from local spice merchants. India had spent the previous two millennia spreading its culture to the Spice Islands of the east. Arabian traders were able to make good money supplying these spices, even with the high prices paid to the Indian middle men, not only to their countrymen back home, but to Europe as well. It was in the year 1492 A.D., that Christopher Columbus discovered the New World. Five years later, four tiny ships sailed southward from the port of Lisbon, Portugal, under the guidance of Captain Vasco Da Gama. Like Columbus, Vasco Da Gama too was searching for a new route to the spice lands of Asia. While Columbus failed to achieve the goal, Da Gama succeeded. In a two year, 24,000 miles round trip, he took his ships around the continent of Africa to India and back to Lisbon. Only two of the four ships survived to reach their homeport. These two ships brought back a cargo of spices and other products worth 60 times the cost of the said voyage. Even under the Dutch rule spice trading in India was encouraged. However a combination of spices spread throughout the world as curry powder with the coming of the British. The British reign in modern India encouraged the spice trading in India. Sandalwood, turmeric, saffron, coriander and a host of other Indian spices were exported from India to other parts of the world. Post independence the trade of Indian spices kept flourishing and a Board of Spices was established to look after the industry. The history of Indian spices depicts that these ingredients were also used in alternative medicines. For instance Ayurveda makes use of several herbs that are also used for culinary purposes. Aloe Vera, cloves, cinnamon, turmeric, black pepper, etc had been extensively used in Ayurvedic medicines. In contemporary India spices are used both as culinary and medical ingredients. There is a popular belief that spicy foods are bad for health. This belief is not only far from the truth but also that; spices in fact have medicinal properties and are good for health. 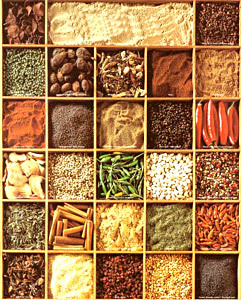 Spices are well known as appetizers and digestives and are considered essential in the culinary art all over the world.. Some of them have anti-oxidant properties, while others have preservative properties and are used in some foods like pickles and chutneys, etc. Some spices also possess strong anti-microbial and antibiotic activities. Many of them possess medicina l properties and have a profound effect on human health, since they affect many functional; processes. For example, spices intensify salivary flow and the secretion of amylase, neuraminic acid and hexosamines. They cleanse the oral cavity from food adhesion and bacteria; they may help to check infection, and to protect the mucous membrane against thermic, mechanical and chemical irritation. Spices increase the secretion of saliva rich in ptyalin, which facilitates starch digestion in the stomach, rendering the meals, which are rich in carbohydrates, more digestible. Spices possibly activate the adrenal-cortical function and fortify resistance and physical capacity. Stroke volume, blood pressure and stroke frequency can be markedly diminished or augmented by means of spices. Spices inhibit thrombus formation and accelerate thrombolysis. During World War I, and a few years after, India was principal supplier of essential oils like thymol, produced both with the help of traditional distillation methods as well as modern steam distillation methods. But the market was lost forever due to invention of synthetic essential oils. The south Indian foods are popular for their non-steaming spices such as cinnamon, cardamom, ginger, cover garlic, cumin, coriander and turmeric. 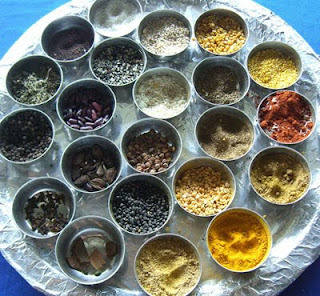 The history of the South Indian spices can be traced back to 7,000 years. It is a chequered history of lands, discovered or destroyed, kingdoms built or brought down wars won or lost, treaties signed or flouted, favours sought or offered. Even today, South Indian spices hold the same spell. In Tamil Nadu, Karnataka and Andhra Pradesh, the cultivation of paprika and a chilli variety with high colour value and low pungency is increased. Within the past one decade, the international trade in spices has grown by leaps and bounds. Some of the South Indian spices include Kura Podi (Curry powder), Sambar Podi (Sambar powder), Charu Podi (Rasam powder), Pacchadi Podi (hot chutney powder) and Pulusu Podi (Sweet `soup` powder). Pulusu Podi is used to make something like sambar. Rasam powder or Charu Podi is a thin broth that can be drunk as soup or eaten with rice. It is rather spicy and makes a nice hot drink with a warm sensation from the spices. Pacchadi Podi or hot chutney powder is used to make all kinds of chutneys with tomatoes, egg plant, raw tamarind, cucumber, etc.